Svarga exlusive resort, luxuriously designed to fit perfectly into its hillside location, is a unique boutique resort hotel, comprising 25 stylish and contemporary units of fully equipped rooms and suites. 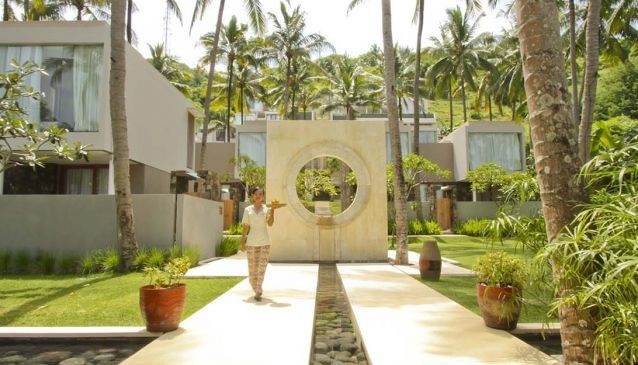 Its gorgeous setting overlooks the ocean, providing stunning sunset panoramas, and the endless Lombok coconut groves. One of the emphasizing concepts of Svarga is health and fitness, and within this the hotel promotes various activities including Yoga and Spa deals, and Golf holiday packages. Svarga also offers a hilltop lounge with infinity pool, with a function room available for wedding/party and other events, and on site restaurant serving International and Indonesian cuisine.